Riley & Scott Mk III (Mark III) is a sports prototype race car built by Riley & Scott company and used by many teams between 1995 and 2005. The Mark III is one of the most decorated models in the history of American endurance racing, with seventeen championship titles in four major American sports car racing competitions (IMSA GT Championship, US Road Racing Championship, Rolex Sports Car Series and American Le Mans Series) and almost fifty wins in the US and Europe, including three Daytona 24 hours victories and one victory at 12 hours of Sebring. Riley & Scott Inc. was founded in 1990 by Bob Riley and Mark Scott. Their first program was developing a chassis for the Trans-Am Series, simply named the Riley & Scott Mark I. After an experiment with Mark II road car, their next model was the Riley & Scott Mark III, which had a competitive debut in 1995. A story about Mark III started in 1993 when Bob’s son Bill Riley started working on a design for a sports prototype car under the WSC (World Sportscar Championship) regulations with an intention to debut in the 1994 season of the IMSA Championship. The season of 1994 was the first year for the new WSC class of open-cockpit prototypes which replaced previous closed-cockpit GTP class. The open-top chassis of Riley & Scott Mk III was made of steel tube frame with carbon composite panels. The chassis featured double wishbone suspension with pushrod activated coil springs. The engine bay behind the cockpit was designed to be large enough for mounting a variety of naturally aspirated engines which were in use amongst IMSA team, mostly the V8s of Ford, Chevrolet and Oldsmobile. All cars used a 5-speed manual transmission. Due to low interest for the first version of Mark III, the car skipped the season of 1994. After the Mark III was redesigned, with a help from aircraft designer John Roncz, the car debuted in 1995. Dyson Racing was the first team that used Riley & Scott Mk III, taking it as a replacement for their Spice-Ferrari. In February 1995, the car had its competitive debut at 24 hours of Daytona. The #16 Dyson Racing’s car started sixth on the grid but Ford’s engine expired after only eleven laps. In March, the team entered the 12 hours of Sebring, finishing in 37th place. Drivers were Rob Dyson, James Weaver and Butch Leitzinger. For the third round, at Road Atlanta, Dyson Racing had two cars and one of them won the race, with James Weaver as a driver. By the end of the season, Dyson Racing scored four more wins with Riley & Scott Mark III. James Weaver finished second in the Drivers Championship, two points behind Fermin Velez, who was driving Ferrari 333 SP for Scandia Racing. For the 1996 IMSA season, several teams purchased Riley & Scott Mk III chassis, using Ford and Oldsmobile V8 engines. The most successful team was Doyle Racing, scoring two wins at the biggest American endurance races with Oldsmobile-powered #4 Riley & Scott Mk III. At Daytona 24h, Doyle Racing’s Wayne Taylor, Scott Sharp and Jim Pace beat Momo Corse’s Ferrari 333 SP. At Sebring 12h, Eric van de Poele replaced Scott Sharp in a car and they beat Scandia’s Ferrari by four laps. Later in the season, Doyle Racing won two events before Dyson Racing ended the season with three straight victories. With seven wins in ten races, Riley & Scott Mk III became the most successful car in a field. Doyle Racing’s driver Wayne Taylor became the IMSA WSC drivers’ champion while Oldsmobile was able to win the manufacturers’ Championship. Doyle’s car also debuted at 24 hours of Le Mans in June 1996 but retired after 157 laps and fourteen hours of racing due to transmission problems. The 1997 IMSA season began with a second Daytona 24h victory for Riley & Scott Mk III. 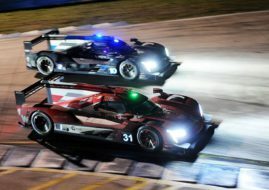 This time, Dyson Racing took the victory with a Ford-powered car, in a historic race which was marked by seven race winners. The #16 car retired after 227 laps, so Butch Leitzinger, John Paul Jr., Andy Wallace and James Weaver joined their teammates in the #20 car, which was driven by Elliott Forbes-Robinson, John Schneider and Rob Dyson. During the 1997 season, Dyson Racing scored six wins and Dyson’s drivers captured first three places in the championship standings. Butch Leitzinger was a champion, Elliott Forbes-Robinson second and James Weaver third. Ford secured the manufacturers’ championship. Other teams using Mark III prototypes were Doyle Racing, Dibos Racing, Target 24, Screamin Eagles Racing and MSI Racing. In 1998, the new United States Road Racing Championship (USRRC) was formed, with Daytona 24h as the main race, while Sebring 12h and other seven races stayed in the IMSA Championship. Several teams, such as Dyson Racing, Matthews-Colucci Racing, Intersport Racing or Transatlantic Racing, competed in both championships with Riley & Scott Mk III prototypes. In the last round of the IMSA Championship, at Laguna Seca, BMW Motorsport/Team Rafanelli was running Riley & Scott Mk III with BMW 4.0L V8 engine, winning the race with Bill Auberlen and Didier de Radigues as drivers. In the IMSA Championship, Dyson Racing’s Butch Leitzinger and James Weaver scored four wins with Mark III but the team finished second in the team’s standings, behind Doyle-Risi Racing. However, Butch Leitzinger defended his IMSA drivers’ title. In the USRRC season, which featured five races, Dyson Racing won three races securing a clean sweep of the championship titles for the team, driver (James Weaver) and manufacturer (Ford). In 1998, the list of Riley & Scott customer teams significantly expanded in Europe, where International Sports Racing Series (ISRS) was formed. BMW Team Rafanelli, Target 24 and Solution F were using Mark III chassis in the SR1 class, with three different engines (BMW, Chevrolet, Ford). Solution F was the most successful team in the 1998 ISRS season, winning one race (Kyalami) and finishing third in the points. In the 1999 ISRS season, Target 24 was running Riley & Scott Mk III with Judd V10 engine, finishing fourth in the points without wins. One more team, the RWS Motorsport, participated in one race with BMW-powered Mark III. In 2000, Italian team R&M was using Judd-powered Mark III, winning one race (Monza) and finishing fifth in the points. The R&M later built its own car based on Mark III, participating in the FIA Sportscar Championship in 2001 and 2002. In 1999, Riley & Scott Inc was hired by General Motors to develop Cadillac Northstar Le Mans Prototype car for use in 2000 season. At the same time, Riley & Scott launched their Series 2 of Mark III in order to adapt the newer LMP rules which were in use widely. That car gained an immediate success, winning the 24 hours of Daytona for the third time in four years. Drivers in the victorious #20 car were Butch Leitzinger, Andy Wallace and Elliott Forbes-Robinson. Dyson Racing won one more race (Mid-Ohio) in the 1999 USRRC season. Dyson’s drivers Butch Leitzinger and Elliot Forbes-Robinson were crowned champions and the rest of the season was canceled. The IMSA GT Championship was replaced by the American Le Mans Series (ALMS) for 1999. In the season-opening Sebring 12 hours, Dyson Racing’s car finished second behind BMW V12 LMR. In the next round, at Road Atlanta, the Team Rafanelli won the race with their modified version of Riley & Scott Mk III, also known as Rafanelli Mk III. Winning drivers were Eric van de Poele and Mimmo Schiattarella. It was the only win for Mark III in the inaugural ALMS season. Dyson Racing finished third, Rafanelli sixth in the teams’ standings. Dyson’s driver Elliott Forbes-Robinson became ALMS drivers’ champion, winning his second championship title in the same year. In 2000, Riley & Scott focused on their new Cadillac Northstar LMP program in the American Le Mans Series. Several teams were using Mark III prototypes in the ALMS LMP class but without any success. On the other side, Mark III was a winning car in the inaugural Grand American Rolex Sports Car Series. The first victory came in the second round at Phoenix, where Robinson Racing’s Judd-powered car won the race. Later in the season, Robinson Racing added one more win but Dyson Racing was the championship-winning team with four race wins. James Weaver also took drivers’ championship with Mark III. The new evolution of Mark III, known as Mark III C (or Series C), was introduced in 2001. The basic design was similar to original Mark III. The Series C is recognizable by different front area with a more rounded nose, four headlights instead of two, the roll hoop only behind a driver (not wide as before) and by a new windshield in front of driver. Mechanically, the Mk III Series C’s biggest difference was the new 6-speed X-Trac gearbox instead of the previous 5-speed. Although Dyson Racing participated in four races of American Le Mans Series, including 12h Sebring, the main proving ground for Mark III was still the Rolex Sports Car Series. Combining an old and new car, Dyson Racing won five races and earned one more championship title for Mark III. Dyson’s James Weaver was drivers’ champion again, ahead of his teammate Butch Leitzinger. Financial problems forced Riley & Scott to declare bankruptcy in 2001, so Bob and Bill Riley founded a new company Riley Technologies which had taken care of the Mk III cars. Two more Mark III C chassis were built for the 2002 Rolex Sports Car Series season, so Intersport Racing and Jim Matthews Racing joined Dyson and Robinson. Dyson, however, chose to use an older car, continuing to win races with it and the team won five races. Dyson Racing won one more Rolex Sports Car Series teams’ title. In the drivers’ standings, Chris Dyson was two points short behind Didier Theys. In the American Le Mans Series, the most notable result was the third place at Sebring 12h for Jim Matthews Racing’s Mark III C.
New regulations for the Rolex Sports Car Series were announced for the 2003 season, which made the Mk III ineligible to compete, so Dyson Racing’s victory at the Daytona finale in 2002 was the last win earned by the original Mk III. In 2003, Riley Technologies concentrated on their new Daytona Prototype. American Spirit Racing, Intersport Racing and Jim Matthews Racing continued to use Riley & Scott Mk III in the American Le Mans Series but without wins or podiums. In the next two years, Intersport Racing and Autocon Motorsports were using Mark III prototypes in selected ALMS races. The last race of the 2005 season, at Laguna Seca, became the final race of the entire Mk III line. After Le Mans debut for Mark III in 1996, no teams were using that car at Circuit de la Sarthe in 1997. In 1998, the French team Solution F competed with Ford-powered Mark III, retiring after 155 laps. In 1999, Solution F returned to Le Mans with two Mark III prototypes, but the result was the same again – DNF. In 2002, Riley & Scott fielded its own Mark III C at Le Mans, driven by Marc Goossens, Didier Theys and Jim Matthews. Their race lasted for 189 laps before they retired. A year later, Goossens, Matthews and Christophe Tinseau were racing for 214 laps before they retired. In total, 17 Mk IIIs were built by Riley & Scott from 1995 until 1998. In 1999, Riley & Scott continued to develop the Mk III, creating four chassis of the Series 2. Several teams also upgraded their cars to match the Series 2 specifications. In 2001, the Mark III C was introduced and five chassis were built.